Are university students spending too much for their education? 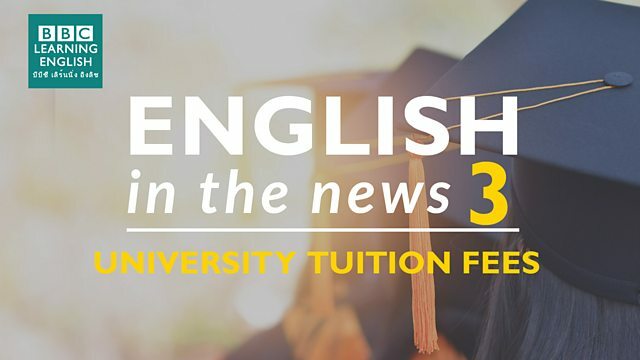 Join Sam and Clare to find out more about possible cuts to tuition fees and to learn four phrases relating to money. What phrasal verb means 'to go in a downward direction'? We are waiting for house prices to ______ before we buy. Everything is too expensive at the moment. Remember, 'to cut' is used to talk about reducing the amount or number in this news story. Which sentence using 'cut' does not mean 'to make something smaller'? This is a fixed expression, so be careful of the preposition. My new sofa was really good ______. It was cheaper online than in the store. The 'b' and the 't' at the end of the word are difficult to pronounce together, so which one do we NOT pronounce? Which letter is silent when pronouncing 'debt'?